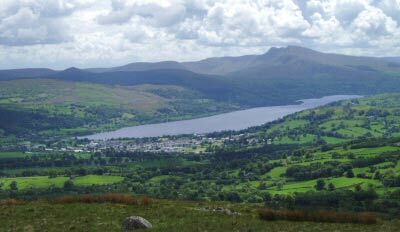 Lake Bala…where the story begins and ends. Wales…the early part of the twentieth century at the heart of the 1904 Welsh Revival in a small town near the shores of Llyn Tegd. Breanna and Kate are identical twins. Kate, ever jealous over Breanna’s singing talent and charm. They see Esmond, a simple man wit a love of poetry, for the first time at a local dance. Kate, is immediately smitten, flirting with him across the room. He finally approaches, walks straight past Kate who is smiling in anticipation, and takes Breanna’s hand for the request of a dance. In that moment, the loom clicks and their fates are sealed. Breanna and Esmond are happy in their marriage but for two things. Breanna cannot seem to stay pregnant, and Owein, a man in town acquitted of the murder of his cousin, is treated harshly by Esmond, as he, along with the rest of the town, believing he was guilty. When Breanna discovers Owein can’t read, she sets about to secretly teach him, every Wednesday afternoon. The only one who knows this secret, is Kate, who having had designs on Esmond’s English boss, Spencer, sets about to seduce him in her sister’s home, disguised as Kate, as she has been observing Spencer, and became aware that his attentions were directed at her sister, and not her. Believing that once she bedded him, he would be delighted to find out it was Kate and not Breanna he was sleeping with, she soon discovers his opinion of ‘Kate’ is not what she hoped, and she continues the deception, every Wednesday afternoon, while Breanna is teaching Owein to read. Esmond gets wind of the ‘affair’ and appears one day in the doorway of the bedroom, shotgun in hand. Before any truths can be revealed, Ian is dying in a pool of blood, and Esmond turns himself in to the authorities. Madness quickly takes Kate over as she does a Lady MacBeth attempt to rid herself of the blood. It is during her ranting, that she realizes Esmond believes she was Breanna, as she had quickly hid under the covers when he entered. There is only one person that can prove it was her. She sets out to Owein’s place, and informs him that Spencer was shot dead, and the police were coming for him, believing he was guilty. Owein, on the ‘kind’ advice of Kate, quickly leaves town to be with his sister. Esmond is imprisoned, refusing to speak beyond his confession and seeing no one. Breanna, thought to be the adulteress responsible, is shunned by the town and her beloved father, Jack. Kate sticks to her story. With no one to take her side, Breanna, succumbs to the cruelty and takes her life. At the same moment, Jack is given the necklace that was clutched in Spencer’s hand. He realizes then, who the real culprit is, but too late. When he discovers Breanna’s body, floating in the lake, he is devastated. He carries her body into the town, the necklace still in his pocket. To deepen Jack’s sorrow, he cannot reveal the truth. His wife has long past. His singing angel is dead, and his only daughter, deceiver that she is, is all he has left, and he cannot bring himself to let the truth be known, for he knows it will destroy her life. Having once been the belle of the town, Jack is crushed by the scant few who attend Breanna’s funeral. The night before Esmond’s execution, Jack pays him a visit, and tells him the truth. The sound of Esmond’s anguish rings through the town. Esmond refuses the leniency that might have been afforded him, as it was a crime of passion. He faces hanging in the morning. The film opens to Drew, a young man in the same cell in current times. He is a punk musician, intrigued by the poem scratched into the wall by Esmond, almost a hundred years earlier. We fade into the same cell, Esmond scratching the poem into the wall as the minister arrives, to hear his confession. Esmond proceeds to tell his story as a flashback, often returning to the cell, and the progression of the poem which progresses, during the film. A tale of sorrow and woe surrounding one seemingly simple lie. resulting in guilt, death and devastation.